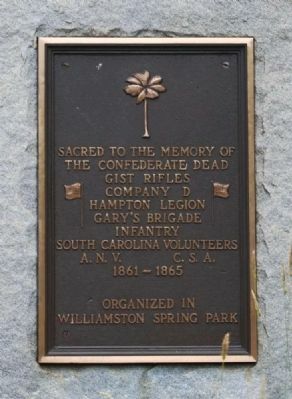 Erected 1941 by South Carolina Division of the United Daughters of the Confederacy. Location. 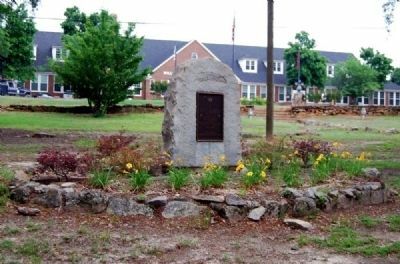 34° 37.083′ N, 82° 28.7′ W. Marker is in Williamston, South Carolina, in Anderson County. Marker can be reached from East Main Street (State Highway 20). Touch for map. Marker is located on the grounds of Mineral Spring Park. Marker is in this post office area: Williamston SC 29697, United States of America. Touch for directions. 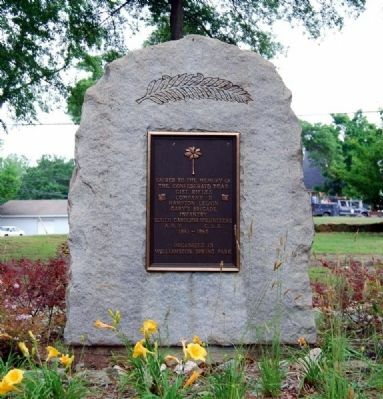 marker); Confederate Skirmish (within shouting distance of this marker); Williamston Municipal Center (about 300 feet away, measured in a direct line); West Allen Williams (about 400 feet away); Williamston (about 500 feet away); Big Creek Baptist Church (approx. half a mile away); Pelzer Presbyterian Church (approx. 2 miles away); "Lord, We Are Grateful" (approx. 4.7 miles away). Touch for a list and map of all markers in Williamston. The Gist Rifles, also called the Gist Riflemen and Gist Guards, were a company composed of men primarily from Anderson and Pickens Districts with some from Greenville and Spartanburg Districts. In April 1861, President Jefferson Davis authorized raising a "Legion of Honor" to be under his orders. The legion was to comprise six infantry companies, four cavalry companies, and one artillery company. The legion would enlist for one year of service in the Confederate States Provisional Army, and the president would appoint all field officers. Wade Hampton was selected to be the colonel of the legion, and it took his name. The Gist Rifles probably mustered in at Columbia on June 12, 1861, along with the other five infantry companies of the elite Hampton Legion. The infantry, cavalry, and artillery components of the Hampton Legion were broken up after the first battle of Manassas. The Gist Rifles remained with the Infantry Battalion of the Hampton Legion, which was augmented to become a full infantry regiment by December 1862. After the Knoxville Campaign in 1863, the regiment was mounted and reassigned to M.W. Gary's Cavalry Brigade, with whom it finished the war. The S.C. Division of the U.D.C. unveiled this granite marker in 1941 for $200. It stands five-and-a-half feet tall. — Submitted December 14, 2011, by Brian Scott of Anderson, South Carolina. More. Search the internet for Gist Rifles Monument. Credits. This page was last revised on June 16, 2016. This page originally submitted on June 4, 2009, by Brian Scott of Anderson, South Carolina. This page has been viewed 1,412 times since then and 15 times this year. Photos: 1, 2, 3. submitted on June 4, 2009, by Brian Scott of Anderson, South Carolina.